Thirdpresence, an AI-driven programmatic video advertising company, has raised $2.4M in seed funding to accelerate R&D on their purpose-built AI. Nordic venture capital firms Inventure and Tesi participated in the funding round together with new and existing investors. This was the first investment from the Inventure Fund III, the largest early-stage technology fund ever raised in Finland. Thirdpresence has developed an in-app video advertising solution which aims to increase ad relevancy, viewability, and brand safety by applying proprietary artificial intelligence (AI). This allows advertisers to match their branding objectives with large-scale video audiences in a safe and result-driven environment. 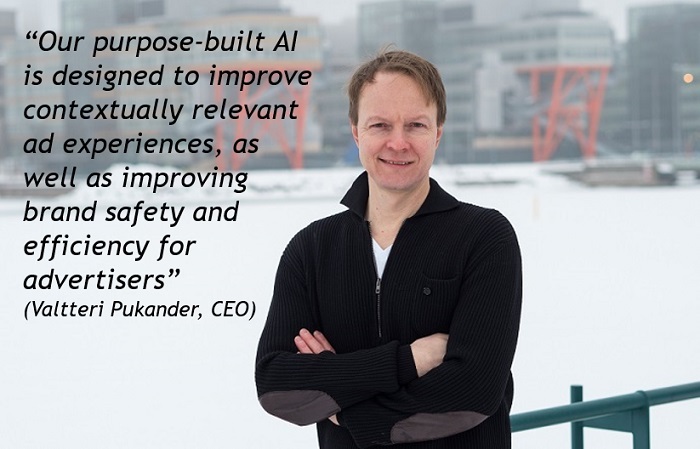 “Our purpose-built AI is designed to improve contextually relevant ad experiences, as well as improving brand safety and efficiency for advertisers,” tells Valtteri Pukander, CEO at Thirdpresence. “Advertisers can expect a higher ROI, and our publisher partners have witnessed increased monetization and higher user retention due to more relevant ads,” continues Pukander. Thirdpresence provides results that sit well above the industry standard by utilizing proprietary AI, which negotiates specific video advertising challenges within the fast-growing mobile application industry. Verified by industry leader MOAT, a digital advertising analytics and measurement company, Thirdpresence delivers a 96% average viewability rate. Thirdpresence was also one of the first 100 companies globally alongside Facebook, Google, and Yahoo to receive certification from the Trustworthy Accountability Group (TAG), an advertising industry initiative to fight criminal activity in the digital advertising supply chain. “After following Thirdpresence for quite some time, we are fully convinced that the team has developed and commercialized their unique tech stack for powering high-quality mobile video advertising. We are very happy to help the founders and current investors build Thirdpresence into a global growth company,” says Sami Lampinen, Managing Partner at Inventure. Founded in 2007, Thirdpresence handles billions of video advertising transactions every day exclusively within the in-app environment. Following the company’s strong growth in 2017, Thirdpresence plans to further invest in developing AI for the programmatic in-app video advertising market. The company has offices in Helsinki, New York, and London and its total funding to date is over $6M.